that he will be retiring from international play, following the 2017 FIBA Melanesia Basketball Cup. Muri’s representative basketball career has spanned fourteen impressive years, with the 196cm forward first representing the country at the 2003 Pacific Games in Fiji. He also competed in 2011 at New Caledonia before suiting up in the red, black & gold for a third occasion in 2015, this time in Port Moresby. 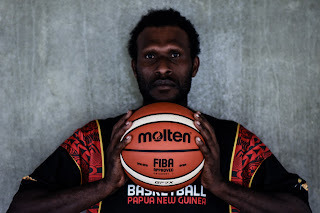 Known for being an unselfish, ‘pass-first’ team player, Muri’s impressive skills earned him selection as a FIBA Oceania All Star in 2003 and at the time, played matches against future NBA players Andrew Bogut and Patty Mills in Canberra, Australia. Reflecting on his career, Muri said he was humbled to have the opportunity to represent his country over such a long period of time. “I still remember my first games in 2003 and that feeling in Fiji,” Muri added. thinks the side has a realistic shot of winning a gold medal. “The core group of guys from 2015 are still involved and that’s positive,” Muri said. with teamwork.” “We also have a really good mix of versatile players who can play multiple positions, so that makes us tough at both ends of the floor.” Muri has just one thing left to accomplish as a player. National Team open the tournament with a first-round matchup against the Solomon Islands at 7pm.